Initial odds are calculated for each golfer. Bookies reduce their odds to ensure they make profit explained here. The market matures as people bet and some golfers may become undervalued. So how to work out which golfers are undervalued? That's what a membership at is for. 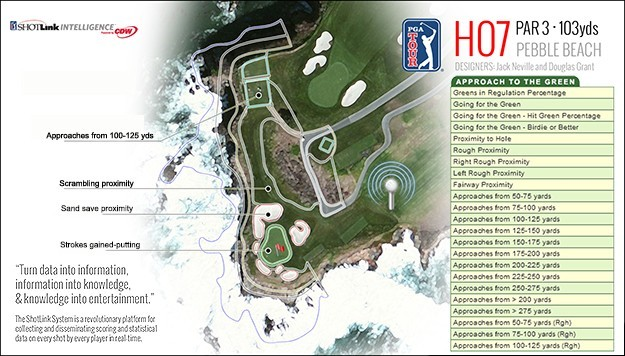 Where are golfers likely to finish? Which players have better odds than they should? PGA Tour has been collecting ShotLink data since 2001. You've probably heard David Feherty talk about the chance a player has of holing a putt from the given distance, the data he's referencing here is ShotLink data. 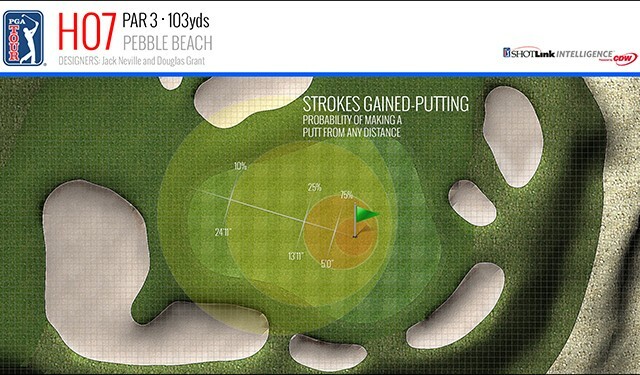 By comparing ShotLink data with how a golfer has performed we can work out how important each aspect of a particular player's game is to their success. The algorithm also places a stronger weighting on more recent data as professional golfers can quickly go in and out of form. To make this data easier to understand for our subscribers the algorithm represents this data as a player's 'On Form' rating in the Foreacst table. Our recent event data, which you can see an overview of by clicking on a row in the golfer's table here comes from the both the PGA Tour and the European Tour. In simple terms; the algorithm compares this data with our previous predictions to workout how to improve predictions in the future. On top of this we need data on the event we'll be making a prediction for. We get data from the tournament's event page on PGA or European Tour's sites. Course length, total par and other variables are easily obtained and useful in making accurate predictions. In the near future we'll be looking to expand the data set to include weather conditions and green coniditions to make the predictions even more accurate. Our world ranking data, which you can see here comes from the Official World Golf Rankings This data is automatically updated every monday after the weekend's tournaments have finished. Finally, of course, we need to determine what the bookies are offering. We don't partner with any of the bookies as our goal is to beat them and they only partner with punters that make them money! So we get all our data from oddschecker.com. We leave it up to the punter to choose which bookie they want to use. Machine Learning is a branch of Artificial Intelligence concerned with learning to perform a task based on examples -- in this case learning to predict a player’s win potential based on past performances. In simple terms, the algorithm finds correlations between player's stats and their performances. Over time, identifying the stats that most strongly correlate with good performances. The stats will be weighted so that some will have a stronger correlation with others. These weightings will also decay so that the most recent stats have the strongest effect on the predictions. The project is a work in progress as we constantly look to widen our data sources and improve our algorithms. Quite simply, maths doesn't lie. As these algorithms grow in power and popularity, more and more people will start using them until everyone realises it's stupid to bet against them. In the near future you won't be able to make money this way so sign up now before it's too late! What's better 1/4 odds paying 5 places or 1/5 odds paying 7? As you can see the best option is 1/4 odds paying 6 places, with a return of 128.5 point. Though, you'll struggle to find many bookies offering that these days. Though this is an over simplification, it's much more important to be placing good value bets. What does an odd of '9/1' actually mean? Betting odds allow you to calculate how much money you will win if you place a bet. 9/1 means that if you bet £1, you will win £9 (and get the original £1 bet back). i.e you will make £9 profit. Which means there is a 10% chance that the event will happen. By reframing the odds this way we can compare our predictions with the bookies. This is equivalent to 3/4 of the original odds. Players earn ranking points based on their finishing position and the strength of the field. Field strength is calculated by the world rankings of the competing players and the Tour it's on. For example, in a Major (with a maximum event rating of 100), a player would get 100 points for winning, 40 for third, 14 for 10th and seven for 20th. The 'weight' of Events gradually declines over time. This enables the rankings to reflect recent form without sudden drops when results fall off the rolling two-year counting period. The most recent 13 weeks are worth full points and the previous 91 weeks 'weight' decline by an equal increment of 1/92(0.0108695) each week. The total points for that Event that count towards their current World Ranking. The total adjusted points earned in the previous two years, up to a maximum of 52 events. As well as a maximum of 52, there is also a minimum of 40 events. If the golfer played fewer than 40 events in the previous two years then the total number of points is still divided by 40. The World Ranking list is based on the avergae number of points the player earns in each event. Simply put, a golfer's World Ranking is obtained by dividing their points total by the number of events they have played, which gives their average. Players are then ranked; a higher average yields a higher rank. © 2019 GolfForecast. All rights reserved.